While cat collars for the sake of ornamentation are often considered a form of animal cruelty, there are many acceptable reasons for wanting your pet to wear a collar. For one, a collar is a form of visual identification (as opposed to a microchip) which immediately informs people that the cat is owned in case it gets lost or wanders around a neighbour’s property. With a collar, your beloved pet has a better chance of safely and quickly getting back home. What’s more, the collar gives you a surface to attach a magnetic or electronic key that allows the cat to get inside and out of the house through the cat flap. So, if you do want to put a collar on your kitty, it’s important that you choose one that will be comfortable and safe for the animal to wear. With that being said, make sure to look for a cat collar with an elastic insert (stretch collar) which can easily adapt to the animal’s neck. But even if you get a stretch collar, make sure to check it often and loosen it as needed. Especially if the cat is not fully grown yet. What’s more, as elderly cats continue to age, their necks may become slimmer as they lose weight – so make sure that the collar isn’t too loose so that it can easily get caught in a branch or other object. However, even if the collar perfectly fits the cat, there’s still the risk that it can accidentally get caught on something and strangle it. After all, cats are naturally curious animals and which love investigating around bushes and tall trees. With that being said, it’s important to make sure that the collar comes with a breakaway buckle that will snap open after sufficient pressure is applied to it such as if the cat gets caught in something. If your pet is free to roam outside at night, a reflective or glow-in-the-dark cat collar can make sure it stays visible to drivers. Additionally, if you don’t want your cat to bring home a dead bird or feast on a rat, a popular solution is to attach a bell to the collar. As the cat moves, the bell will rattle and alert the prey allowing it to get away. 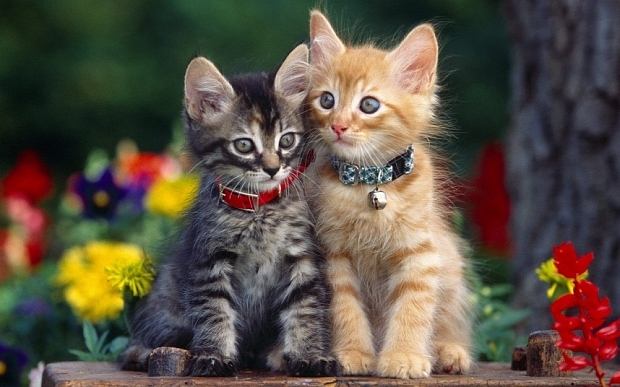 There are even collars that can protect your cat against fleas which can be helpful if you have an outdoor cat. But although they can be a great preventative measure, free control collars contain chemicals which can stop to function after some time. With that being said, it’s also important to take your cat on regular flea treatments at a licensed veterinarian.